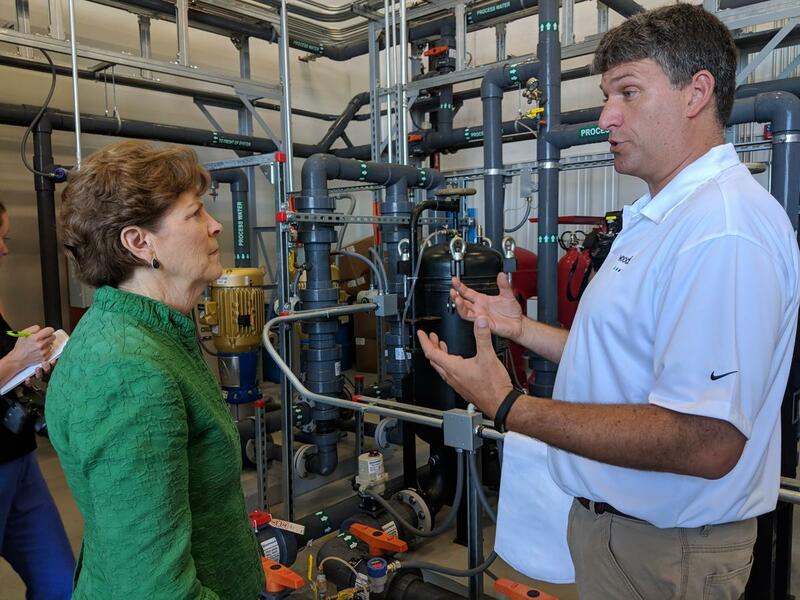 Last year, Sen. Jeanne Shaheen toured a Pease water treatment plant to learn more about PFAS contamination in the area. Federal lawmakers want more health care for veterans exposed to toxic PFAS chemicals, including at the former Pease Air Force Base. Around 400 military installations, including Pease, are thought to have PFAS contamination stemming from use of firefighting foam. A growing body of research links these industrial chemicals to serious health problems – especially developmental and immune suppression, and potentially some cancers. Now, Democrats in Congress want the VA to compensate and treat vets with PFAS-related conditions identified by ongoing federal research. Their new bill is co-sponsored by New Hampshire Reps. Annie Kuster and Chris Pappas. He spoke at a press conference Thursday. "The VET PFAS Act renews the solemn obligation we have to those who have solemnly served the rest of us, and will improve their health and well-being, and we must pass it into law." The bill comes as state and military officials work to study what other chemicals, along with PFAS, that Pease veterans may have been exposed to over the decades. Those veterans, at a public meeting late last year, urged the VA to put a “presumption of service connection” in place for certain health problems in vets exposed to PFAS. Pappas says this bill would do that, offer disability payments for affected vets and families, and “cover a variety of chronic conditions, including cancer, as well as those that are determined to be linked by an ongoing study at the CDC." "Some [veterans] have waited far too long for meaningful action on this issue,” Pappas said Thursday. “And many more may not even realize that they have been exposed or that there's a serious long-term health threat to themselves or their families." Meanwhile, a new federal report adds to evidence that the military left dangerously high levels of PFAS in a drinking water well at what's now Pease International Tradeport. The well’s PFAS concentrations – primarily of the chemical PFOS – peaked in late 2012, according to the report. The well wasn't shut down until spring of 2014. The CDC is taking public comment on the report until June 3, and will discuss it with the public in Portsmouth on April 16. Civilians exposed to PFAS at Pease will also soon be the model for the first national PFAS health study. And New Hampshire’s new drinking water testing and treatment standards for four kinds of PFAS, including PFOS, are due out later this year. Public comment on the proposals, which regulators have suggested may be tightened before being finalized, closes on April 12. As federal regulators consider new drinking water standards for toxic PFAS chemicals, military officials are reportedly pushing for less stringent rules. The Environmental Protection Agency is planning new standards for testing, treatment and cleanup of PFAS contamination.